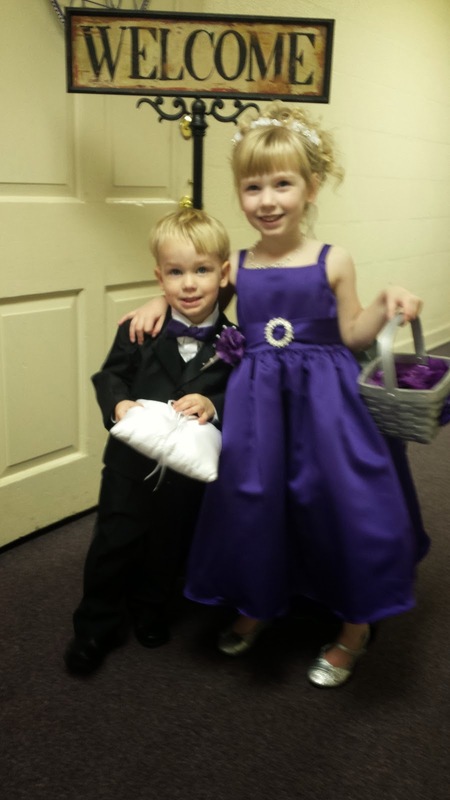 A few months ago, a friend's daughter asked if my kids could be in her wedding. I laughed hysterically. She wasn't kidding. I laughed because they've seen me try to get my kids to walk to the car after the gym. It's absolutely like herding ADHD cats on speed, not even exaggerating. How in the world did they expect my kids to walk in one direction down an aisle? But of course I agreed because this is a HUGE honor. So with a healthy amount of anxiety we looked forward to Keesa's big day. Everything leading up to the wedding was a blast. 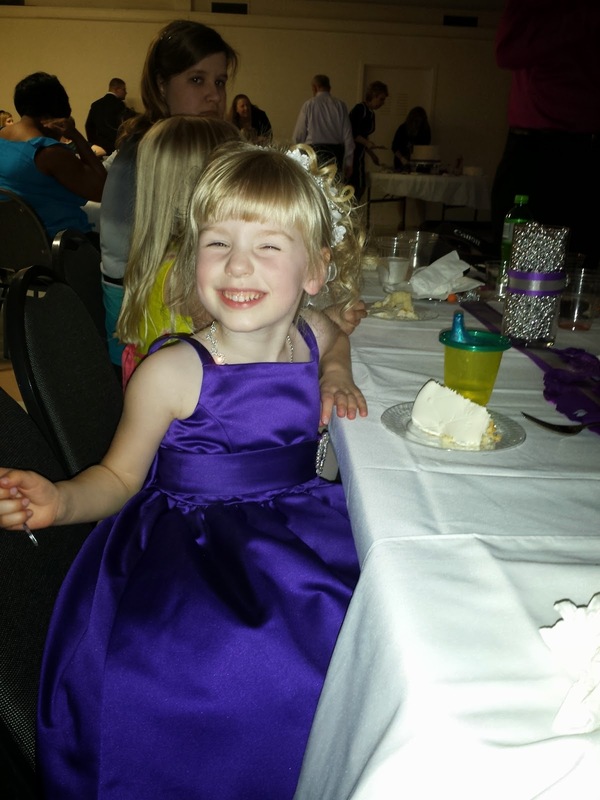 It was incredibly stressful taking Sarah to try on her flower girl dress at David's bridal. And a little nauseating since there were far too many mirrors in that place for this 9 month preggo. But it was so much fun to watch her twirl around in those princess dresses. Then taking Cody to buy his tiny tux melted my tiny heart. He looked so cute! Saturday was the big day. And it was a busy busy day! But the kids did so good. I mean they really did. It's dicey with my kids when they don't get naps. Sarah gets to tired she just becomes ridiculously obnoxious running her mouth non stop just talking to keep herself awake. And Cody will just melt down and cry over nothing. Sarah and I left about 10am to head to the salon to get her hair done with the bride and the maid of honor. She was very excited about this. 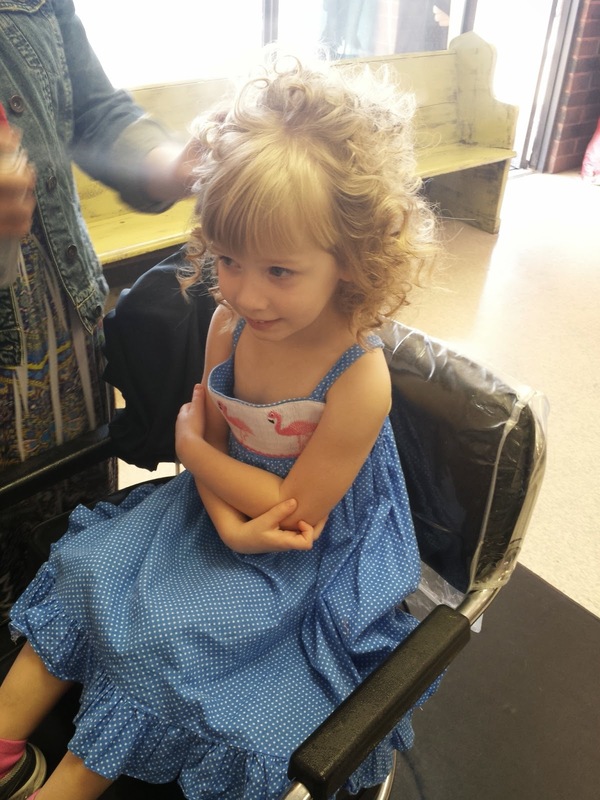 She knew she was getting special princess hair. 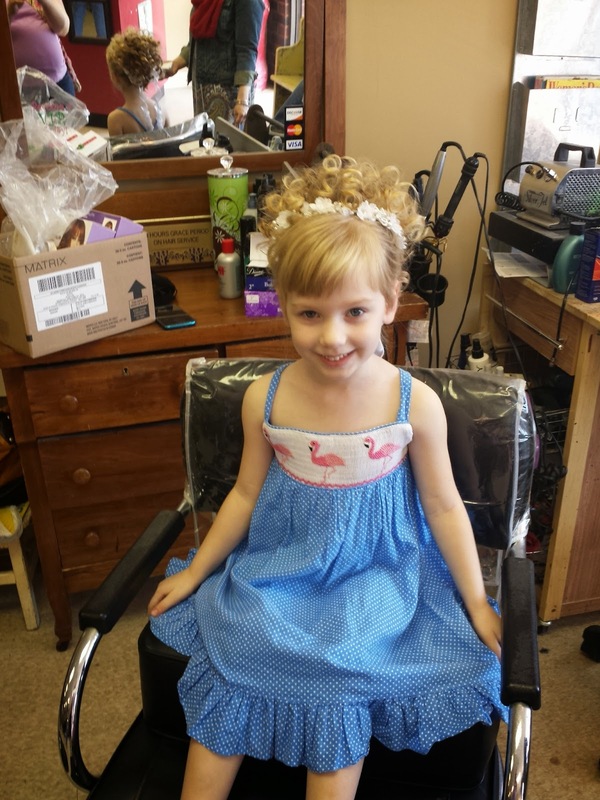 And the stylist bribed her to sit still with a promise of a doughnut when she was done. Pretty hair in process. Sarah saw it and said, "mom look I have lion hair! Roar!" All primped and ready to go. 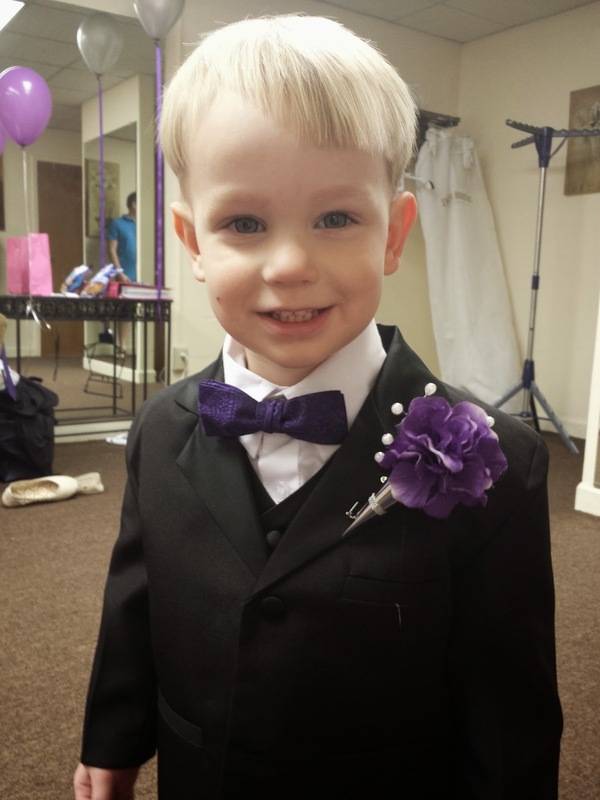 Cody stayed home with daddy to get ready for the wedding. Cody loves it when we wipe Chris's shave brush on his face. So Chris decided to let Cody "shave" just like him. Mens folk getting ready after their showers. I love Cody's face in this picture! After everyone was done primping it was time to head to the chapel to get dressed and ready for pictures. They did so good with their jobs in the wedding! 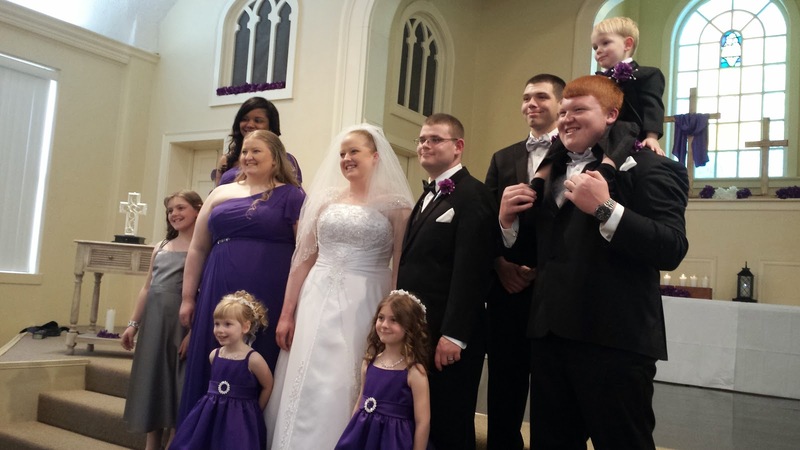 Cody walked nice and slowly down the aisle with his big Cody smirk. He loves being the center of attention sometimes. At the rehearsal he stood with the girls, but this time he decided to stand with the men. I was trying really hard not to be that person pulling out a cell phone at a wedding but I caved when I saw how adorable he was with the big boys in their tuxes. Of course, since I was embarrassed to be doing it, it was for naught and the picture was blurry. Oh well. Sarah and the other flower girl walked a bit fast down the aisle but Sarah had a huge smile on her face and was working hard to empty her basket adding extra flower petals to the stairs when she realized she still had so much left in her basket. My favorite part was when the Pastor told the guests, "you may be seated" Cody popped a squat right on the stair he was standing on. He follows directions so well sometimes. Ha! After a while he was tired of holding his pillow so he kept hitting Kyle in the leg with it trying to get Kyle to take it from him. But the best part was when the kids got released to sit with us they actually sat and stayed quiet! Hallelujah! I was so stressed about them acting like heathens during the wedding and having to be taken out. Or Cody having an accident. The ceremony was beautiful. Keesa looked amazing and they both looked very happy. It was such an honor not only to be there to witness their marriage but especially sweet to be asked for our kids to participate. After the wedding the kids had full bridal party pictures. And they were starting to get a little tired so I hope the kids smiled well enough for the pictures. I grabbed a couple of cell phone shots. 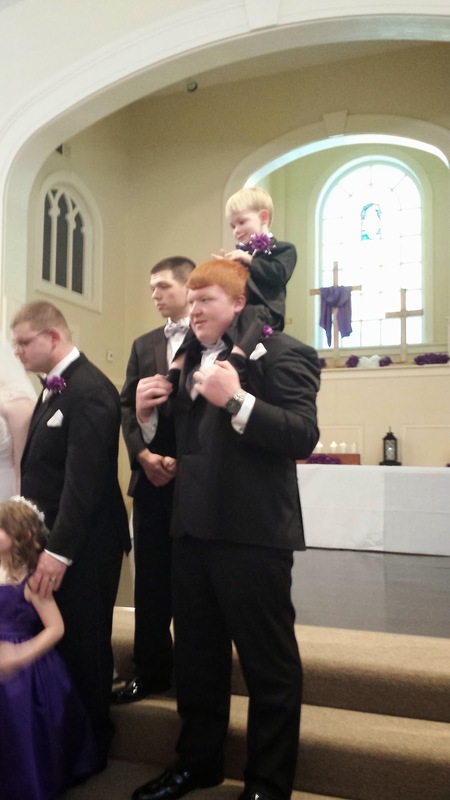 Yes Cody really stayed on Kyle's shoulders for most of the bridal party pictures. 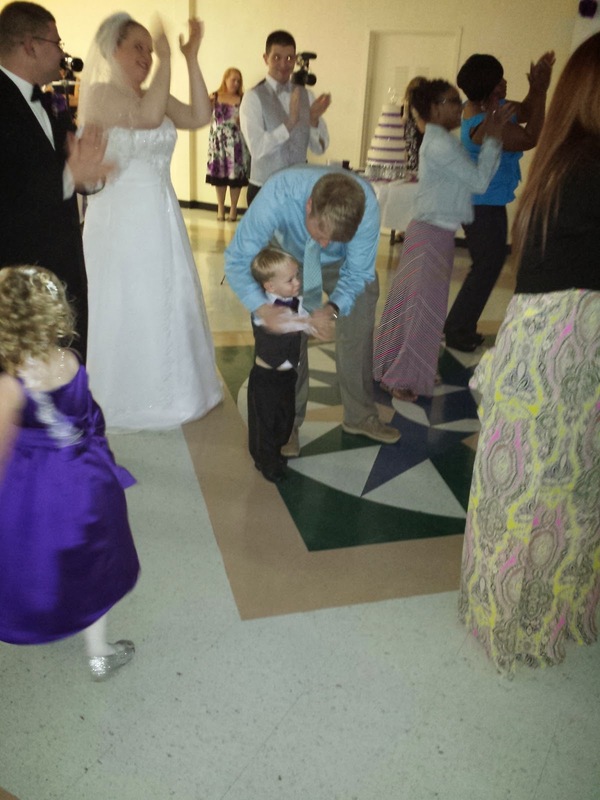 Then it was time to boogie down at the reception. After the kids keeping it together for so long I pretty much let them run around the dance floor as much as they wanted as long as they stayed away from the cake and punch tables. Chris helped Cody do the Cha Cha slide. 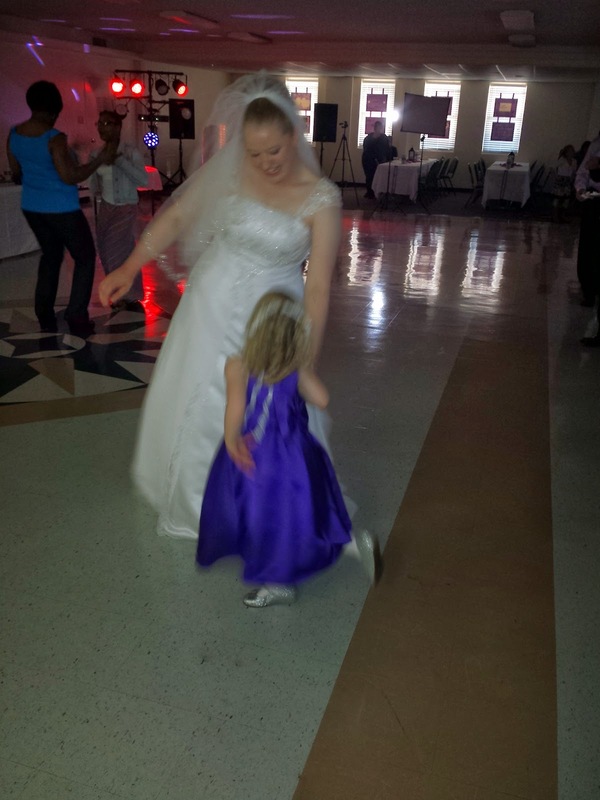 Sarah got to dance with the bride. And of course, we scarfed down some yummy cake. Congratulations Keesa and Michael! Marriage is the best adventure! My, what beautiful kids you have all fancied up! I mean, seriously! What a dream for Sarah! 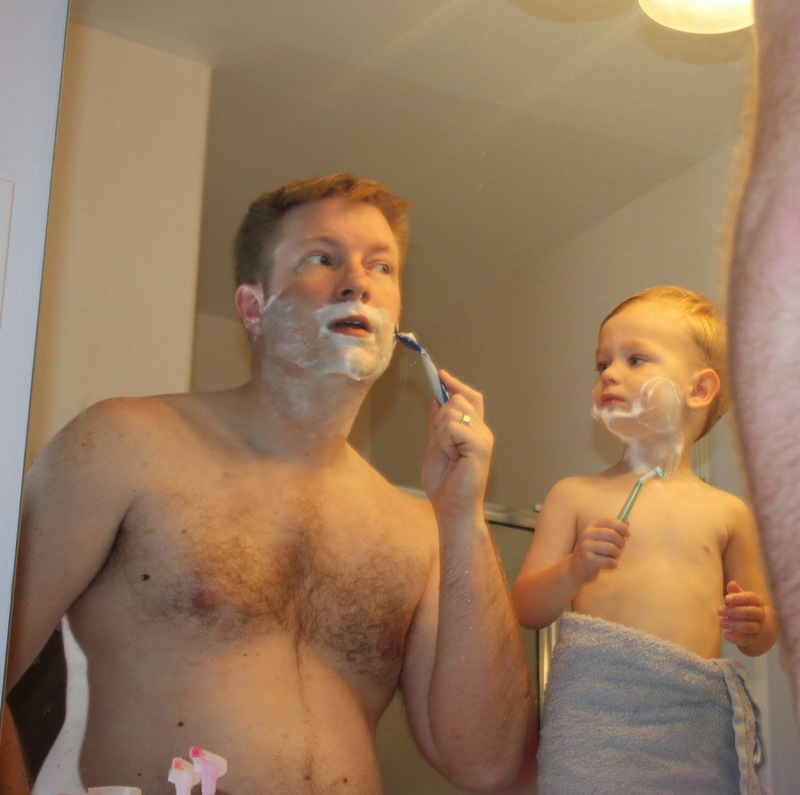 And, the pics of Dad and son shaving are my favorite. It's just wayyy too sweet. Sounds busy but so worth it!